This Clover cool white LED 2 tier pendant light in polished chrome with crystal is ultra-modern, contemporary and on-trend. Featuring a large ceiling mount with mirror chrome fascia and two circles suspended by cables. Two different sized rings are decorated with faceted crystal rectangles and fitted with acrylic diffusers, with the larger ring at the top and smaller drum underneath. Each ring contains a total of 28w LED’s that shine through the crystal for a very bright 2760 lumens of sparkling light. 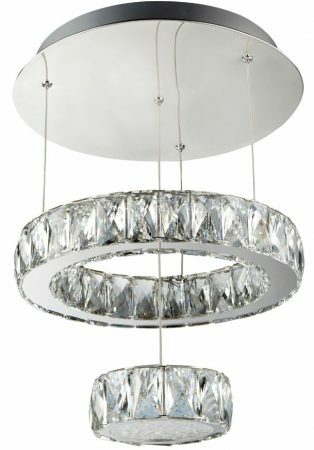 An opulent polished chrome pendant ceiling light that adds style and a modern edge to any contemporary living space. The two stacked circles are adorned with crystals that sparkle and dazzle when illuminated making it perfect for fitting over a dining table, in a bedroom, living room or hallway. This on-trend light is supplied by Searchlight who manufacture some of the best traditional and modern classic designs such as the Clover cool white LED 2 tier pendant light in polished chrome with crystal you see here.